One of the good things about my spending an increasing amount of time with the flower-sender is access to a whole new world of cook books. Not only do I have my three shelves worth, but I now have his shelf to browse through when looking for inspiration. He needs to watch out though as I've already pilfered one of his books and it is now residing in my kitchen. At first glance it might not sound that exciting. It is a book of soups. I'm keen on soup. Especially in the winter months. But I tend to stick to the same kind of soups. 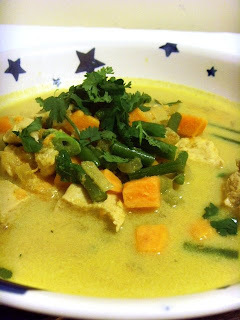 Smooth, vegetable-laden soups are generally my thing. 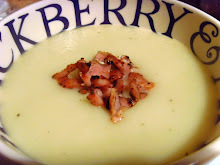 I've never experimented much with soups containing lumps. These have always been less my thing. I've always rather thought that a soup with lumps is really a stew in disguise. I take it all back. This marvellous book contains a total of 500 different soups. Well - it probably contains around 100 soups actually, but each one is accompanied by a page listing four or five variations. There are soups to tempt everyone from hearty chowders to delicate Asian broths, chunky minestrone to smooth and velvety creamed soups. 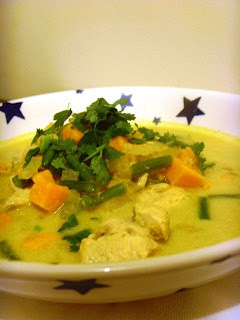 Despite my smooth-soup leanings, I found myself drooling over the pages dedicated to 'meals in a bowl' and the first soup I tried was this superb spicy chicken and sweet potato soup. It was a real hit and one I'll make again and again. You can vary the ingredients as you wish - I threw in some green beans and broccoli that I happened to have lying around. You could leave out the chicken. Swap it for prawns or pork. Make it entirely vegetarian. The world is your oyster so to speak. 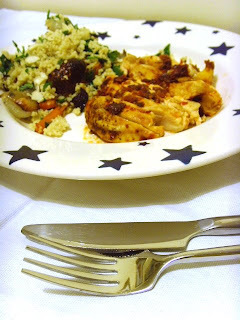 As well as a filling and satisfying supper, this also made a great lunch to take to work the next day... Or at least it would have done had I not left it on the counter when I raced out of the house. 1. Heat some oil in a large saucepan and add the onion. 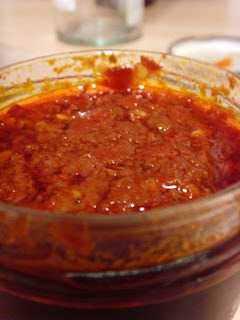 Sweat for around 3 mins before adding the garlic, ginger and chillies. Fry for a further couple of minutes. 2. Stir in the ground spices and heat for another minute or so. 3. 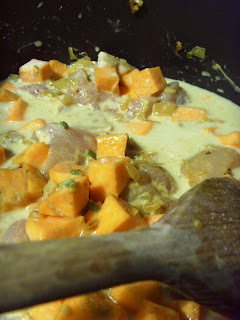 Add sweet potatoes, chicken, coconut milk and stock to the pan. 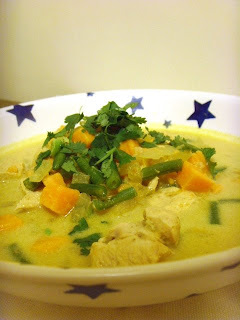 Bring to the boil, reduce the heat, cover and simmer for 10 minutes before adding any other hard green vegetables. Simmer for another 5 minutes. 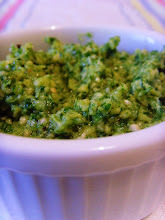 If using spinach, add to the pan for just a few minutes. The soup should simmer for approx 15 minutes in total - until the potatoes and chicken are cooked. 4. Using a slotted spoon, fish out around half of the sweet potato. This is a little fiddly, but not too time-consuming. Mash/crush half of the sweet potato before stirring back into the soup to mix. 5. Chop the coriander and stir half into the soup, reserving the remainder for garnishing the soup. 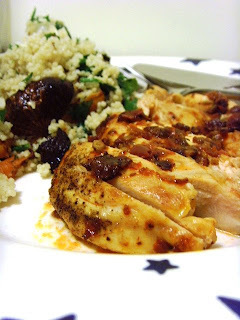 What is the first rule of cooking from a recipe? Read it through thoroughly before you start. That way you can be sure you have all the ingredients and equipment you require before you start and also you get an idea of what is involved in the preparation. Shame I don't follow my own advice really. 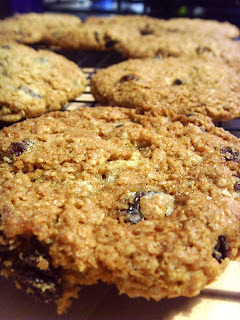 If I had, I might have noticed that Martha Stewart's recipe for oatmeal and raisin cookies makes five dozen of the chewy, delicious babies. Five dozen. What is a girl supposed to do with five dozen cookies on a Friday evening? When she lives alone. When she can't take them into work. When there are only so many she can force-feed to the flower-sender. 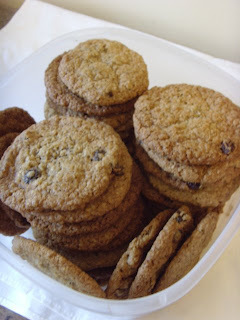 To be fair, between the flower-sender and I, we have managed to eat an astonishing number of cookies over the weekend. This is mainly due to the fact that they are seriously good. The recipe comes from my newly favourite cook book. I bought it in New York and is entitled 'Martha Stewart's Cookies'. This glorious book is packed with over 175 different cookies and is divided into enticing sections called things like 'light and delicate', 'cakey and tender', 'rich and dense' and 'crisp and crunchy'. 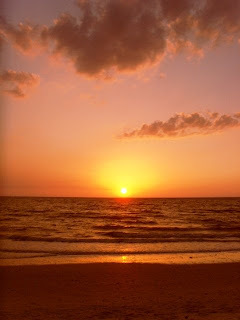 Each divine creation is photographed in such a way that you can't wait to get into the kitchen a whip a batch up pronto. 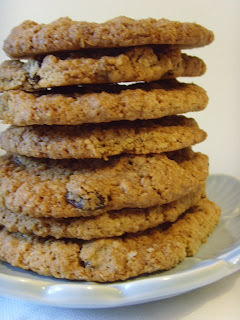 On my list to bake soon are gingersnap palmiers, chewy molasses crinkles, cashew caramel cookies, maple-pecan shortbread, brown-butter toffee blondies, earl grey tea cookies and chocolate-ginger brownies. I could easily go on. In the back of the book you'll find tips on technique and great ideas for presenting your bakes as gifts. The only downside of this glorious book is that not all the ingredients are readily-available to the non-American cook. In most cases though, you can probably think up a reasonable substitute. And life is made easier if you get yourself a set of cup measures too- they are not expensive and it means you don't need to convert the measurements. 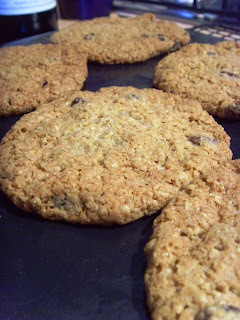 Oatmeal and raisin cookies have for some time been a favourite of mine. 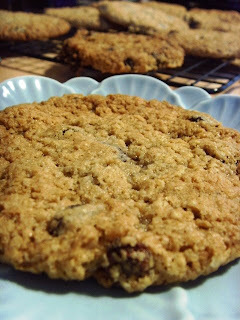 I love the chewy texture and, as these ones contain wheat germ, oats and raisins, I can kid myself that they aren't actually that bad for me. In fact, with those ingredients they are practically a health food, no? (...let's overlook the whole pat of butter and stack of sugar!!). Bake these. You won't be disappointed. 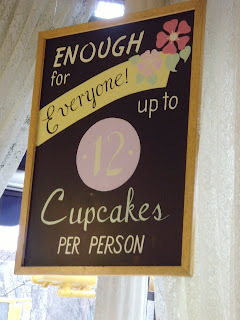 You may want to reduce the quantities though! 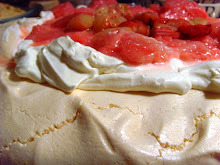 Here is my version of Martha's recipe. 2. 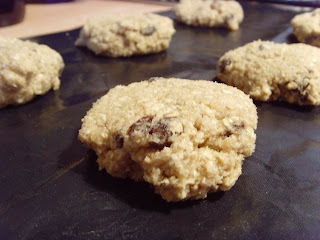 In a large bowl, stir together the oats, four, wheat germ, baking soda and powder, cinnamon and salt. Set to one side. 3. Cream the butter and sugars until pale and fluffy. This is easiest in an electric mixer with the paddle attachment if you have one. Mix in the eggs and vanilla and then mix in the bowl of dry ingredients until combined. Finally, mix in the raisins. 4. Using a dessert spoon (or similar), take spoonfuls of the dough and shape into balls. Place on baking sheets lined with greaseproof paper - be sure to space them around 2 inches apart as they will spread. Flatted each ball slightly. Try to make sure that each doughball is similar size so that the cookies bake evenly. 5. Bake until slightly golden and just set - around 12 minutes in my oven. Rotate the baking sheets halfway through the cooking time. 6. Allow cookies to cool slightly on the baking sheets on wire racks for 5 mins before transferring the cookies to coo completely on the wire racks. Thank you for all the lovely comments left when I was suffering on holiday. I'm pretty much better now though it has taken a long time and the combination of jet-lag and still feeling a bit weak hasn't really seen me much in the kitchen. Next week I plan to get right back into it (...as well as visiting all your blogs which I've thoroughly neglected over the past few weeks). 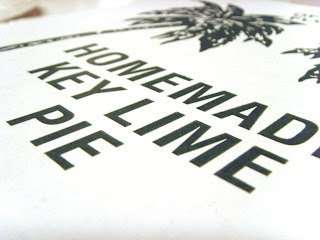 My beloved Key Lime Pie. As I've detailed before, I'm on a permanent quest to find a recipe that matches up to the fabulous pies I find in Florida. As yet, I am unfulfilled. 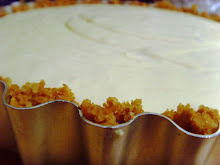 Perhaps it is for the best - if I found the 'ultimate' recipe then I might just eat my entire body weight in a Key lime frenzy and that would not be so good. My aunt (who lives in Florida and whom I was visiting) is fully aware of my quest for Key lime greatness and has even tried to find a way of sending real Key limes to me in the UK! 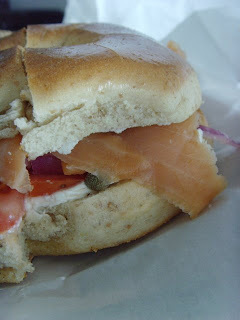 The New York bagel with Lox and cream cheese. I'm told that a proper NYC bagel tastes better due to the New York water. Who knows if this is true but this one was fairly delicious - stuffed with smoked salmon, cream cheese, onion, capers and (oddly, I think) tomato. Yum. 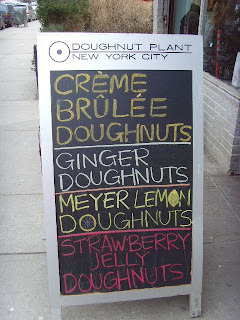 The doughnut plant. 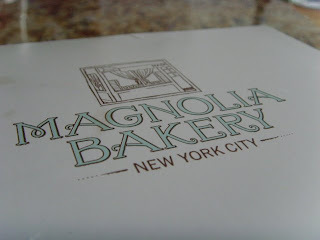 If you go to New York, you simply HAVE to go there. This is not a suggestion. It is an order. Sadly no pictures of the doughnuts - I gobbled them up before the camera made it out of my bag. 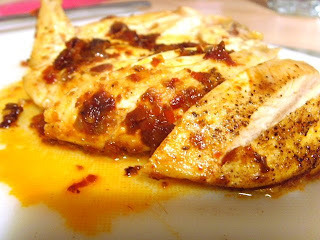 The Meyer lemon glazed version was dreamy! 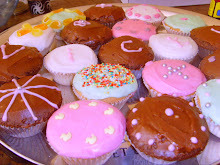 The cupcakes were certainly pretty but I was surprised not to see more flavours. Just vanilla, chocolate and red velvet. Lots of other goodies too but kind of hard to see them as the shop was so crowded. 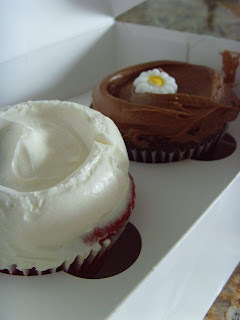 I chose a chocolate and red velvet version. The chocolate was truly delicious but the red velvet? Just a bit... ordinary. 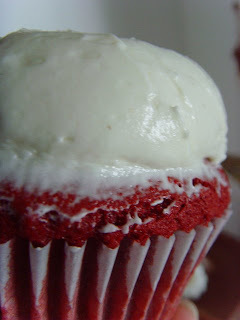 Much better was the fabulously large slice of red velvet cake I enjoyed at Dean and Deluca the previous day. I have to confess that I think those at Treacle on London's Columbia Road give those at Magnolia a run for their money. But maybe that's just me. 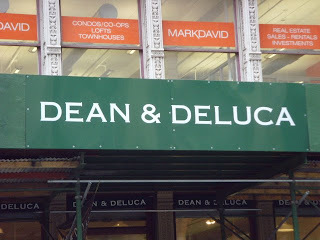 Talking of Dean and Deluca. Well worth a visit. 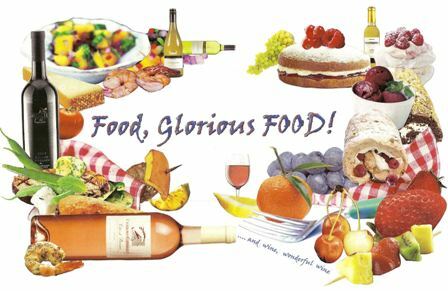 A foodie paradise. I couldn't resist picking up a few gourmet treats! 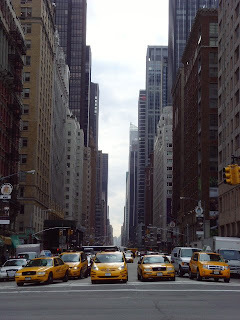 There was so much more - the sights and smells of Chinatown, the fabulous restaurants in New York, the cocktails. New York is truly a terrific foodie destination.